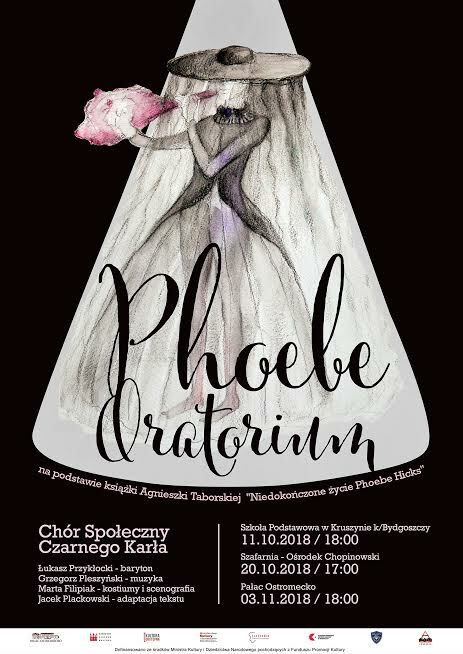 The “Social Opera” project comprises the preparation of the opera performance titled “Phoebe Hicks”, based on the fragments of Agnieszka Taborska’s works, by the inter-generational Black Dwarf’s Social Choir – from writing the libretto, preparing costumes, music, make-up, choreography, to its advertising and giving performances. The integral part of the project will comprise activities aimed at developing the competences of very young people, adults and the elderly (the largest group): vocal exercises, physical exercises, dance classes – all of those not only in order to give the performance in a professional way, but also to develop key social competences: self-confidence, openness, imagination, taking care of one’s physical and mental well-being, the ability to establish long-lasting relations or active participation in decision-making processes. Another important feature of the project will be giving the performance in the towns and villages having no access to national culture. The documentary showing the whole process, which is going to be shared free of charge, will become the added value. Subsidized from the fund of the Ministry of Culture and National Heritage, from the Culture Promotion Fund. Cardinal Stefan Wyszyński Primary School in Kruszyn – 10/11/2018, 6 p.m. The Chopin Centre in Szafarnia – 10/20/2018, 5 p.m. The New Palace in Ostromecko – 11/03/2018, 6 p.m. The Primary School of Kruszyn is situated in a historic palace, built in the eclectic style by the end of the 19th century, precisely in 1882. The building was funded by the German Colonization Committee, in the place of former knights’ court, originating from the times when Kruszyn belonged to the owners of Strzelewo – the Bniński Count’s family. By the end of the 19th century, Kruszyn was purchased by a buyer named Wekwart, who later resold the aforementioned property to the Colonization Committee, which, having significant funds coming from the French contribution after the 1870/71 war, used it to erect the building which was supposed to become a school and teachers’ and Protestant pastor’s accommodation. On the 1st of September 1924, the Protestant German school was transformed into a Polish paritetic school according to the regulation issued by the Poznań School District. During the war, in the school’s building, there were the barracks for the female work force. Throughout that period, the school’s building became considerably damaged. The educational activity was restored on the 11th April 1945. In 1991, a general renovation of the school started. Its first stage included changing the windows, ceilings and the roof. The attic rooms were transformed into classrooms. Finally, in 1996, the decision was made to reconstruct the whole building and additionally, to build a gym by the school. The entire investment was realized in 1999. A classicistic court from the second half of the 19th century. A two-storey brick building, built on the plane of a rectangle, with two risalits from the garden’s side and a four-storey tower by the northeast corner. The entire building was covered with flat, four-gable roofs. The interiors lost their style due to their being adapted for serving hotel functions. The current court was most probably built in the years 1854-1880, from the funds of the Karwat family – Aleksander or Lucjan Florian (most probably using the walls of the previous building). In 1949 the Hall of Memory of Fryderyk Chopin was opened in the palace. In the years 1957-1977 the hall was called The Fryderyk Chopin Musical Lounge. In 1979 there was a fire in the building, due to which in the years 1980-1988 the functioning of the centre was put on hiatus. In September 1988 it was reopened, this time under the name of the Fryderyk Chopin Culture Centre in Szafarnia. The mansion in Szafarnia, once the property of the Dziewanowski arms-bearing Jastrzębiec family, played the host to young Fryderyk Chopin twice, during the holidays [in the years 1824-1825]. It is also possible that Fryderyk’s father, Mikołaj, also worked there as a tutor. The New Palace is part of the park-palace complex, formerly belonging to the Schönborn family, and in the years 1890-1945 to the von Alvensleben family. It is a building (Pałac Nowy, New Palace, German Neues Schloss) built in 1849, designed allegedly by Karl Friedrich Schinkel, commissioned by Jakub Martin Schönborn. In 1912, an additional neo-baroque wing with a ballroom and garden terraces was built. After 1945, in the palace there were a school and a dormitory for deaf children, which contributed to some major devastation of the property (historic parquets were covered with tiles, the walls – with plywood wainscoting, fireplaces were bricked up and stuccos were covered with several layers of oil paint). After 1990, the winery and the rooms: ball, golden, orange, green and the Italian parlour were restored. The palace is surrounded by a 36-hectare English-style scenic park (oak trees, hornbeams, larches and chestnut trees), designed by a Prussian gardener.